Boracay is in the province of Aklan. 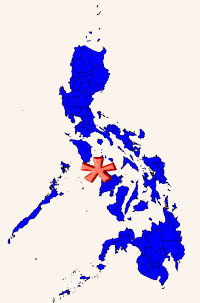 Aklan is located in Panay. This is the center of the Philippines. These central islands are the Visayas, Region 6.The Island of Boracay is shaped like a dog bone. It is 8 km long, and 1 km wide at it’s narrowest. White Beach and Bulabog beach are the primary and secondary tourism beaches, both located opposite of each other.Boracay is located 2km from Caticlan, the mainland gateway for sea and air access to Boracay. There are ports both in the south of Boracay (Cagban Port) and Caticlan (Jetty Port) to ferry passengers across the Tabon Straight. The Low Season is when the winds change and blow eastward into White Beach. There is more rain than usual, but there are also fewer tourists, better prices on accommodations, and other lower prices. The low season begins in May, and ends in October. With the increase in Asian tourists, the low season is still very busy in Boracay. During High Season, the winds come from the back of the island, and White Beach is protected. The wind blows out to sea, leaving the beach pristinely clean and generally calm. It is also winter in the northern hemisphere, and tourists come in numbers in search of sun, heat, beach and party. High Season starts in October and ends in May. The Peak Season is when the tourists are at their height. This includes Christmas, New Year, Chinese New Year, and Holy Week (Easter Week). Most resorts have a +10% to +25% premium on their rooms, and the island gets fully booked. Make sure you book as far in advance as possible. 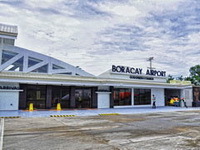 Boracay Airport is a smaller airport 5 minutes from Boracay. 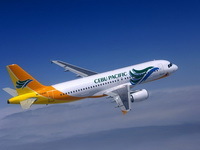 There are domestic flights from Manila and Cebu. A motorized trike will take you to the Jetty Port, less than five minutes away. This is definitely the preferred airport for ease and convenience. Due to the small size of the runway, smaller turboprop airplanes are used. 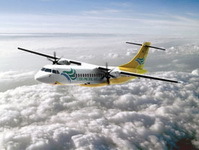 As of March and are the only airlines using Boracay Airport. 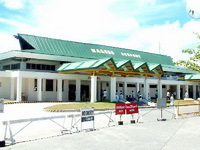 Kalibo Airport is a larger airport 90 minutes from Boracay. Kalibo airport that has some international flights, and accommodates larger jet airplanes. There are vans and busses outside the airport. Prices fluctuate. As of March 2015 and are using Kalibo airport. From Caticlan Port, you will take the banca (pumpboat:photo left) to Boracay Island Port (Cagban Beach). This is a 10 minute boat trip, and boats depart frequently in both directions all day. When you arrive in Boracay, you will need to take a motortrike from Cagban to White Beach (ten minutes/125 PHP).You will get dropped off on the main road, and make your way to White Beach. The whole trip from the mainland to your resort should be less than an hour, and the route is very standard. Just follow the tourists. There are plenty of porters to help you with heavy baggage (20 PHP per piece). Most visitors to Boracay stay on the White Beach on the footpath and travel by foot. It’s an hour and a half walk from one end of the beach to the other. Motor vehicles are not allowed on the footpath and beach. There are motorbikes with sidecars (trike:photo left) on the main road running parallel to White Beach. The fare between boat stations is 10 PHP. You can also hire a trike and driver to take you around the island for 200 PHP/Hour. This is a good way to visit other beaches such as Puka Shell Beach, or the highest point on Boracay, Mt. Luho View Point. You can also rent a motorcycle from the vendors on White Beach, however they are quite expensive. Wear a helmet and go slow. Most hotels these days have air conditioned vans to service their guests. You can also Island Hop around the island by Paraw, native canoe type sailboat (photo left). They are all over White Beach and should be 700 PHP per hour with crew. Go directly to the actual boat station 1 or 3 and talk to the boatmen for best prices. Popular rides are to Puka Shell Beach, sunset cruise, or up and down White Beach. There are also ATVs available for rent on the main road past station one, as well as off road buggies. They cannot be driven on the main road parallel to White Beach. The currency is the Philippine Peso (PhP). Bill denominations are: 20, 50, 100, 500 and 1,000 pesos. If possible, bring your cash with you. ATMs dispense in 500 PHP bills: they are frequently offline or out of funds, so do not rely on them exclusively. There are ATMs on White Beach, at D’Mall, and on the main road that will accept foreign debit/bank cards.Foreign Currency is best exchanged at the banks or money changing stores. Only the larger restaurants and hotels accept credit cards including MasterCard, Visa and American Express, although a 5% surcharge on credit cards is standard. Personal checks are not accepted. Traveler’s checks get a lower exchange rate and should be changed at Allied Bank. After a delicious meal why not work off the calories with a bit of shopping. Take the time to walk white beach end to end to find some of the unique shops Boracay has to offer. As you leisurely stroll white beach you will be approached by men from the Muslim Vendors Association selling sunglasses, pearls, model sailboats, fake watches, belts and numerous other trinkets. There are a few stalls offering made to order bracelets customized with your name or whatever wording you decide upon. There will also be other people with laminated cue cards selling scuba diving, water sports, sailboat adventures and other activities. There are other services you will be offered as you enjoy your walk such as pedicures and manicures,beach side massages, henna tattoos, and hair braiding. Sometimes it can get frustrating hearing the same sales pitch over and over again, but just smile and shake your head…relax you are on vacation. D’Mall is a one stop shopping experience for everyone’s needs and desires. Starting at Budget mart on the main road all the way through to white beach you will find designer clothes, pharmacies, souvenir shops, travel agents, optical and dental services, fantastic European Deli not to mention upscale and budget restaurants and a number of fine happy hour establishments. From Crafts supermarket/department store heading towards white beach you will find a wet market offering all kinds of fruits, vegetables, meat and seafood. There are also cell phone repair vendors, souvenir shops, an alcohol store and some budget friendly hotels and restaurants. Find everything you want and more at D’Mall. This “small market place" is by no means small as suggested by its Tagalog name. With numerous alleyways you can search around for an afternoon of shopping for all the souvenirs you can carry. There are vendors selling fresh vegetables, fruits, meat and seafood for you to cook up yourself as well as many of the restaurants in the marketplace will cook to your pallets content. Remember to wear your bartering cap to get the best possible prices. Boracay Island is serviced mainly by two mobile providers, SMART and GLOBE. They have good reception through most of the island. Visitors can purchase a SIM card with phone number for 65 PHP and then purchase load (user minutes) in amounts as low as 10 pesos. Text messages are definitely the main form of local communication at a cost of 1 peso per text. (The Philippines is the text message capital of the world). Talk time is more expensive between 6 to 8 pesos per minute. International text messages are quite affordable (most countries 15-25PHP). Landline calls are cheaper, and best for international calls. There are several International Phone booths along the White Beach footpath and in D’Mall. Some resorts also have international phone service, but generally at higher rates. Philippine country code is +63. Boracay’s area code is (036). MyBoracayGuide’s phone number would be +63 36 288-9999. Boracay has several internet cafes along White Beach, at the Tourist Information Center, and in D’Mall. Half hour is 25-40PHP, one hour is 50-75 PHP. Connections are not very fast, but sufficient to email home. There is a private post in the office in the Tourist Center which is open at 9am-9pm daily and on holidays. There is one LBC branch next to Budget Mart. The Bureau of Immigration (BI) can extend visitor visas as well as process other changes required in visa status. For visa extensions you will be required to make photocopies of your passport and fill out a visa application form. The cost varies depending on your visa and desired length of stay. You can expect to pay around 3,140PHP for a one month extension. There is a dress code so don’t wear board shorts or tank tops. Located on the main road next to E’Mall, the best time to go is on Mondays and Tuesdays, from 8-12 or 1-5. For more information call 288 5267. This entry was posted on 星期二, 二月 7th, 2017	at 5:46 下午	and is filed under guides-zh-tw, 最近	. You can follow any responses to this entry through the RSS 2.0	feed. You can skip to the end and leave a response. Pinging is currently not allowed.